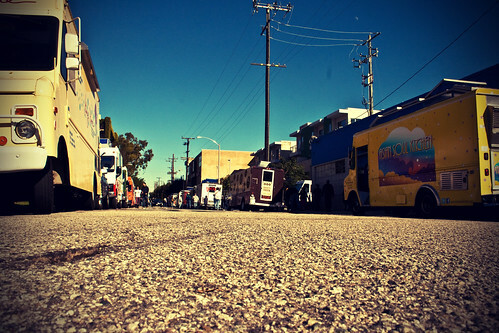 Tired of chasing the food truck of the moment all over town? Wish you could sample things from multiple trucks for a smorgasbord? Does your favorite food truck never come by your work, no more? Never fear, because a couple of native Angelenos (yes, they exist) have brought the entire Los Angeles food truck movement together in one place, at one time and on one date. All you have to do is make this Saturday your point day to try all things truck at The L.A. Street Food Fest in Downtown Los Angeles. Putting some holiday touches on the festival will be UniqueLA, who will make the gathering of food trucks also a last-minute V-day gift destination at their pop-up Valentine’s Day Marketplace. The event will cost you $5 to get in (sorry, VIP tickets all sold out), and featured food vendors have specially priced their menus to range from $1 – $5 for each item. Admission includes one free drink ticket as well as eligibility to win cool giveaways. Thirsty for more? Beer and cocktails will be available at two cash bars – with proceeds from donated beverages being donated to the LA Regional Food Bank. Take a picture in the photo booth and watch a Capoeira demo. And while you’re there, don’t miss the food truck you won’t see on the street (for now); Chef Ludo Lefebvre will be serving his fried chicken made famous during his LudoBites runs. I hear the “pop-up truck” has quite the design, and we already know that his chicken is quite the food. Also premiering are the Dim Sum Truck (@dimsumtruck) and The Fry Girl Inc (@thefrygirlinc) for VIPs. Got a bike? LA Street Food Fest will be hosting a free bicycle valet for all attendees. They also encourage riding the Metro – the 7th & Figueroa stop will be where you want to get off. I’ll see you there! This entry was posted in Deals, Downtown LA, Events and tagged @lafoodfest, Chef Ludo, Dim Sum Truck, Downtown LA, DTLA, festival, fried chicken, L.A., LA Regional Food Bank, LA Street Food Fest, los angeles, Ludovic Lefebvre, SauceLA, street food, The Fry Girl Inc, UniqueLA. Bookmark the permalink.